I received a sample packet of Moroccan Rhassoul clay from Yours Essentially sometime back and didn’t quite know what to do with it. 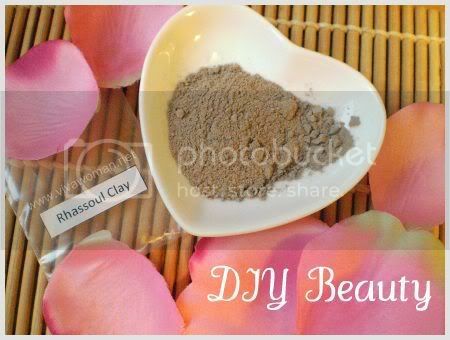 I didn’t want to use it as a mask on my face and so I ran a search on the Web and found that Rhassoul clay can also be used as a shampoo to remove dandruff or excess sebum from the scalp. 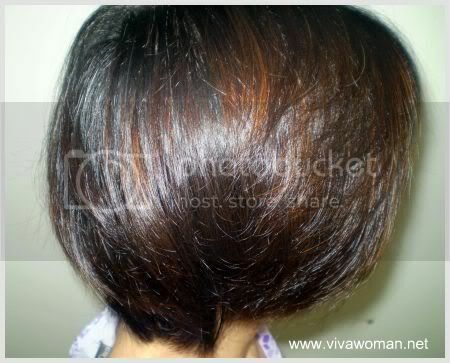 Hair washed with the clay is said to become soft and shiny with more volume. Plus some users were even commenting that the clay can help reduce the need for frequent hair washing. And that all sounded great to me because I have a peculiar hair condition characterized by fine, thin and oily hair which I have to wash daily. 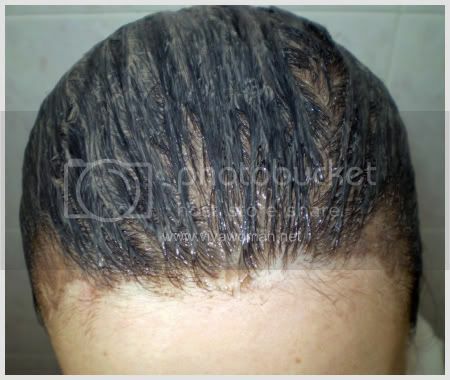 The first time I tried, I blended the sample packet of Rhassoul clay with witch hazel and water and applied it on part of my scalp since there wasn’t sufficient. Of course my hair wasn’t clean but I felt it was something worth trying out and so I ordered more from Yours Essentially. 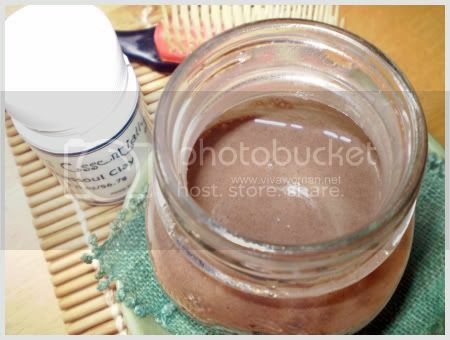 I made a shampoo recipe consisting of water mixed with 4 tablespoons of Rhassoul Clay and 1 tablespoon of baking soda. I left the mixture thick but watery enough to rub into my scalp and apply all over my head. And this is how I look with the mud pack on my head! It’s got an earthy smell which is not offensive but even though it wasn’t drippy, I have to admit that it was a little messy to apply. I left the Rhassoul clay on for about 20 minutes before washing it off with warm water. It was easy to wash and my hair didn’t tangle up. In fact, it felt quite soft and smooth. Because there were no suds, I felt my hair wasn’t washed clean enough. However, it looked quite alright after blow drying. My hair looks fluffy and full of volume isn’t it? But the top of my scalp did look a tad greasy. The good thing was that my hair stayed almost the same the entire day and I didn’t even attempt to apply any dry shampoo to it. It was easy to comb and very manageable even though I didn’t apply any conditioner unlike most of the other users who recommended doing so. On the whole, it was a very interesting experience to use clay to shampoo my hair. I say I had pretty impressive results from something that did not foam and produced suds. All in all, I tried it three times but I won’t be doing this again because it is pretty time consuming, not to mention that I have to use quite a lot of the Rhassoul clay to make the shampoo. Perhaps with frequent usage, I maybe able to shampoo my hair less but I don’t think I want to use this long term. Instead, I’ll find out where I can get Rhassoul clay soaps which will probably cost me less money and less mess! As for the rest of the Moroccan Rhassoul clay which I have, I’ll use it to wash my face and report on the results in due course. I suspect I will have some good things to say about it. Fascinating! Morocco, you say? Would you be any chance know if Moroccan oil is available in SG? i guess it suits my mum, huh? I have used it on my hair and its great for treating my drandruf! 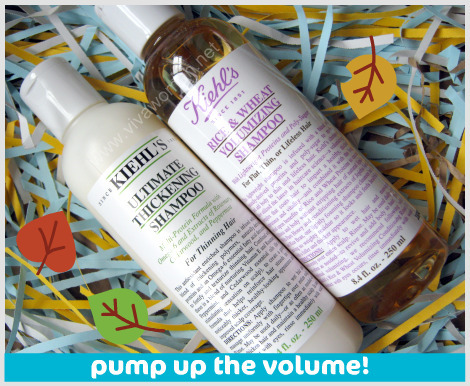 I have been using diff commercial products, anti-dandruf shampoo, etc and none of it works! I apply it and lather it together with shampoo on my hair. The results- dandruf is gone even after one application! troubledGal: Fantastic! How often do you have to use it? how would you use the clay as a deep condition? Lady: You mean for the hair? No. It’s too drying. I use it on my face and leave it for a couple of minutes though. 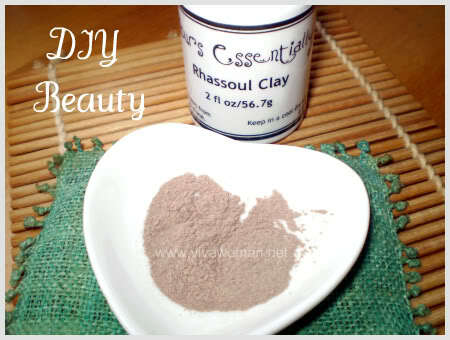 rahssoul clay? where can i find it? can you please inform us where i can buy them. You need to get it from those DIY ingredient supplier. If you search the internet there must be a shop where you can buy it. In the Netherlands they sell it in health shops. Okay, thanks. I will check it out. But it seems a bit far to have it shipped here. I’ve read that you can make it up ahead of time to make it easier to apply. You keep it tightly sealed and can use it easily. I think you might have used more than is really needed. I think you were trying to get a “shampoo-like thickness” and used too much. I’ve read that you should really just concentrate it on the scalp; massaging it in, then just rinse and the only time it touches the rest of the hair is as it is rinsed away! If your hair is longer, they say you can put it all the way down, but it really should be a milk consistency. That’s why you said it took up too much product: you’re mixing it way too thick! Of course, if someone is still using all sorts of thick, silicon-y hair products, this natural method likely won’t clean that off…..but who knows, it might. You maybe right. I should try to get hold of he clay to try again. I was indeed trying to get a thicker consistency. i would like to know how to order the Raashoul Clay. hi can i get this in singapore? pls let me know where!! thanks! Try http://www.milagrotrading.com/store/ but not sure if they have this said item. Sesame, I read that the grains are actually quite sharp and may damage hair and if they are sharp, wouldn’t they tear on the skin??? ?